It is interesting how we remember things. Little things. Things that we don’t necessarily need to have stored in our brain, but somehow find their way to stay with us forever. I remember some things that I myself can’t believe I remember. Memories of when I was five and they have no significance to me at all. Then there are memories I remember of someone, but it doesn’t define that person. That person might not even remember it themselves. Then there is music. Music has been a big part of my life. I can’t describe what it does to me, but I know it gives me hope, love, fear, anger, and a purpose. For certain albums, I can remember where, when, and the mood of the day I bought the album. The Early November For All Of This was bought sometime in the month of December of 2002. It was at Compact Disc Center in Bethlehem, Pennsylvania, and ironically enough the mood and weather of the day duplicated the cover art of the album. A chilly evening where the wind was just right. The funny part is I went to the record store to buy a different album, which I did, but bought this album on a whim. It is an e.p. and was cheap and when I was younger I bought a lot of albums on a whim. Not to mention I was a Drive-Thru Records kid. Anything that label put out, I knew it would be good. Granted, some bands I didn’t care for, but the music was always manageable. I can’t remember if I knew any Early November songs, but I just decided to buy it. Usually when that happens, the album means a lot to me. It surprises me and with a feeling I can’t recreate. As for the other album I bought, I can’t remember it or know if I still own it. That’s how much this album meant to me. I’m not one to keep e.p. albums, but this album flows and lasts as a full length album. During this time, I listened to a lot of pop-punk music, which Early November has hints of especially in the song “All We Ever Needed”, but Ace’s lyrics and vocals brings out powerful emotions to the songs. This was something I never been exposed to. I just knew fast paced songs about girls. Not songs where the structure had a build up to the singer spilling everything out. Then taking it a step further and describing everything in full detail. It was a feeling that I was missing in music. When the song “Sunday Drive” hit my stereo, I was wrapped up in a whirlwind of emotions. Call it emo, call it lame, call it wussy music, but I call it honest. It is something this music industry is missing. I remember after hearing this song, I sat in my room with an acoustic guitar trying to learn the song. To this day it is ranks as one of my favorites by Early November. What could you be doing that is so much fun? In vain to “Sunday Drive” is “Come Back”. A light sounding song about losing the one you love. This is a song that I think gets looked over in the Early November catalogue. A simple song that has an uplifting melody which ends with Ace’s vocals raising in emotion, but falling back down to a calming tone. It should be known that the second song on the album, “I Want To Hear You Sad”, is the song that put Early November on the scene. Starting off with a catchy melody and then building up to an even more memorable chorus, this song either made you love them or hate them. As I got older, I still listen to this song, but you can tell Ace’s writing and the band’s musicianship has gotten way better. It is hard to not sing along to the song when there are group vocals. Also growing up hearing the chorus after a break up gives you hope that everything will be fine. Too be young and in love. Even though “I Want To Hear You Sad” is the song that put the band on the map, the song that defines Early November has to be “Every Night’s Another Story”. A hard hitting fast paced song, which needs to be played loud. If you ever see Early November live they will always play this song. When they do though, be prepared to not only see the crowd go insane, but also the band. If you are lucky, you might even see them smash their instruments. I owned this album on c.d. since 2002, but when it was released on a 10” vinyl for the first time, I had to purchase it. Enjoy The Ride Records specializes in vinyl reissues, and managed to produce a few Drive Thru Records albums. Own by Ross Shotland, and based out of New York, Enjoy The Ride Records puts out high quality vinyl. Even though my vinyl came with a scratch in the first five seconds of side A and skips, it isn’t anything to cry about. Also this is now out of print and I will take what I can get. The packaging is great with high quality cardboard that houses the vinyl. 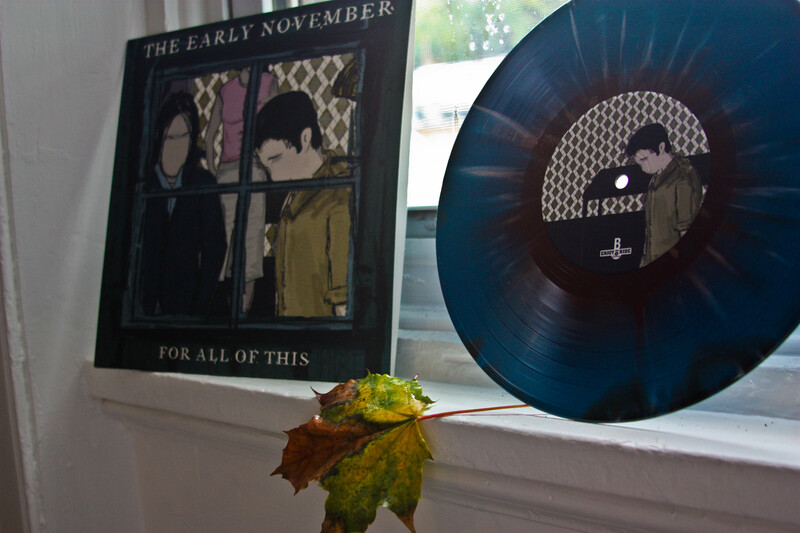 The vinyl is blue with white and brown splatter, which I think looks very neat, and fits the feel of the artwork. The reason I wrote about this album is because I will be seeing Early November live again, and if you are in the Philadelphia area on October 6, take a chance to see them. They will be performing at the Union Transfer and it is sure to be an astounding performance. Thanks a bunch! This is an old post, haven’t look at this in a while.